The manufacturing industry is vital to the diversity and strength of the Australian economy. New South Wales (NSW) is home to a range of highly innovative, competitive and world-leading manufacturers that are leading the way. The NSW Government recognises that manufacturing is undergoing a transformation across the industrialised world, and is committed to harnessing and ensuring the industry’s strength in the future. As the sector changes, NSW manufacturing businesses are increasingly using new technology or employing advanced business models that allow them to compete based on value. This includes adopting Industry 4.0 business models, which offer opportunities to lower production costs while delivering high-value manufacturing solutions. NSW manufacturers produce almost one third of Australia’s total manufacturing output, generating around $33 billion in industry value. They also directly employ around 253,000 people – almost one third of all jobs in the sector nationwide. Advanced manufacturers in NSW provide the most valuable and skill-intensive parts of the production process, including high-tech design and development, innovative research, product customisation, client-focused support and repair services. NSW has strengths in advanced manufacturing in the aerospace and food and beverage sectors. To build on Western Sydney’s thriving manufacturing industry, the NSW Government, in partnership with the Commonwealth Government, are developing a high-tech, state-of-the-art Aerospace and Defence Industries Precinct, adjacent to the new Western Sydney Airport. 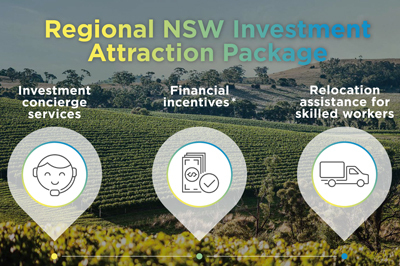 The new airport will also form part of the Western Sydney Aerotropolis, which will give food and beverage manufacturers the opportunity to be part of an agribusiness precinct. Through this, Western Sydney will become the global hub for science infrastructure and technology, and research and development. The strategy lays the foundation to ensure the manufacturing industry remains a source of economic strength, job creation and innovation in NSW. This is done by setting out targeted, practical initiatives to grow the sector and build the capability and capacity of businesses, while continuing to foster a supportive business environment. grow export and attract investment. NSW advanced manufacturers are invited to register to participate in the Advanced Manufacturing Connect program. The Connect program aims to strengthen engagement and collaboration across the industry. To be part of the conversation, register your interest below. Read about successful NSW-based manufacturing companies that are embracing advanced technologies and Industry 4.0 to boost productivity and be competitive in a global marketplace. There are a number of grant programs available through the department to help support businesses grow.